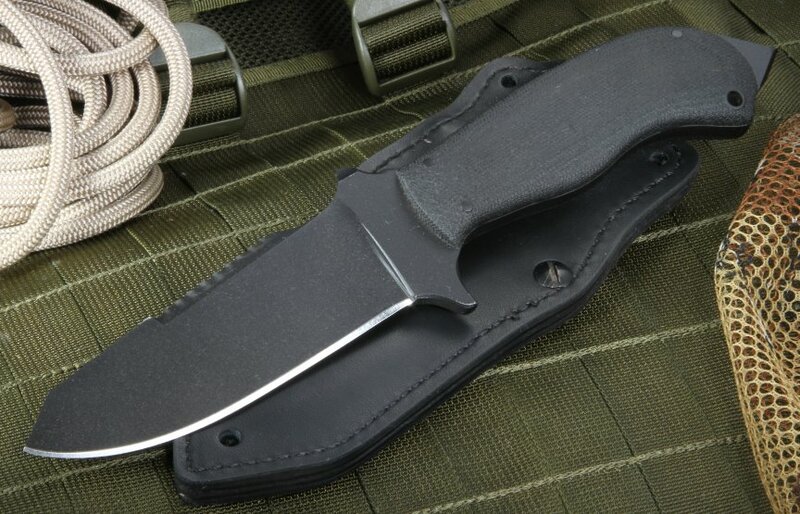 Built to suit the needs of elite military and special forces units, the Winkler Knives II S.A.R. 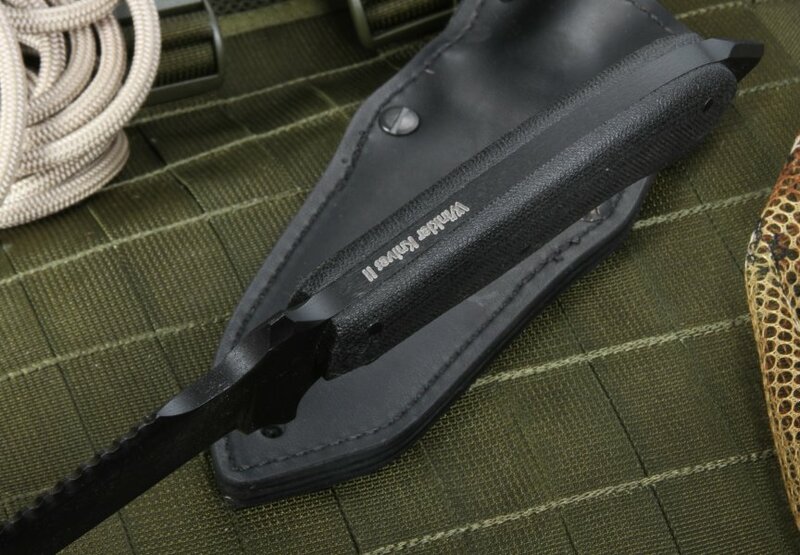 is the perfect fixed blade knife for any combat, tactical, or survival applications. The S.A.R. features a wicked 5-inch, CPM-154 stainless steel blade, coated with a sleek black Caswell finish to eliminate glare and increase durability and resistance to wear and corrosion. Serrations along the blade's spine provide extended cutting versatility and adaptability, and the drop point blade shape and flat grinds make the S.A.R. 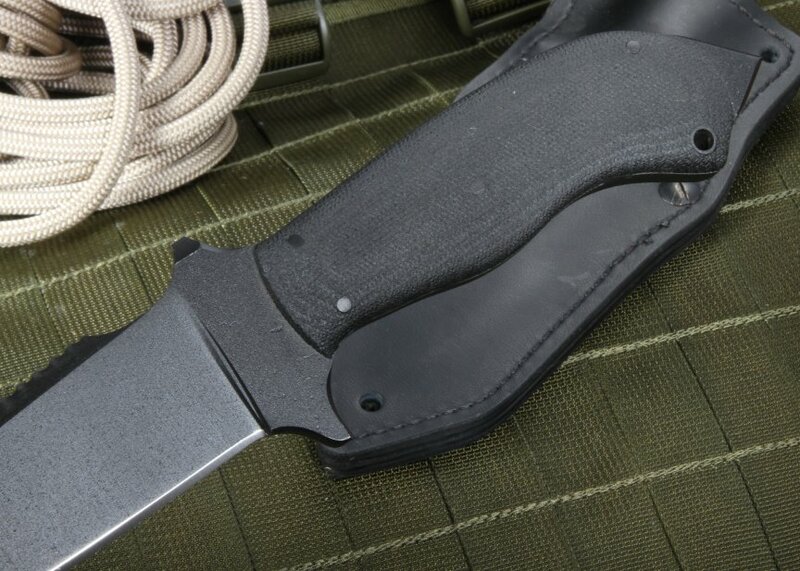 the perfect blade companion for any outdoors, tactical, or combat uses. The S.A.R. 's full tang construction is encased in sturdy black Micarta handle scales, providing a solid and stable hold and exceptional blade control, even when used when the handle is wet from rain, snow, or sweat. The 5-inch handle also features a solid cross guard for safety and extended blade handling. A sturdy glass breaker adds more to the usefulness and versatility of the S.A.R. 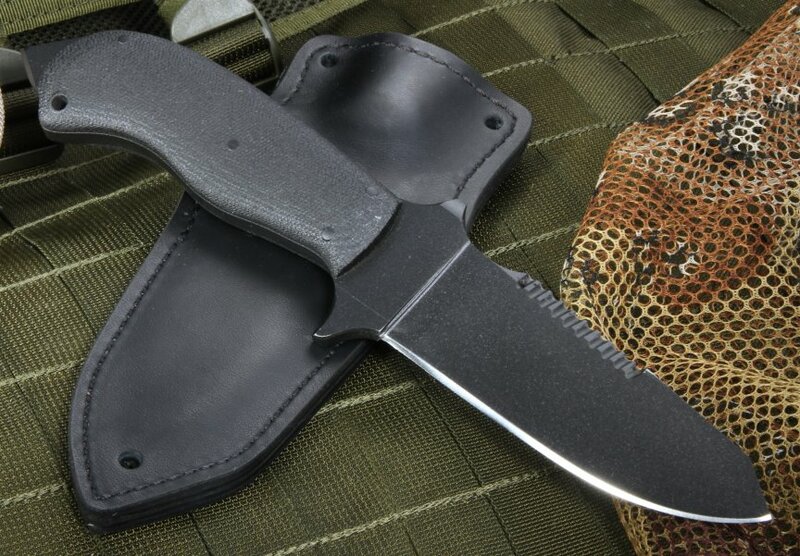 The Kydex-lined leather sheath can be worn horizontally or vertically and allows for a quick, smooth, right- or left-handed draw with minor adjustments. The S.A.R. also features a lanyard hole in the handle to provide extended carry options. You'll be ready for anything with the S.A.R. strapped to your backpack, vest, belt, or pants. Since 1988, Daniel Winkler has made some of the highest-quality knives and tactical gear available. The Winkler Knives II line (WKII), inspired by Winkler's work with Special Forces teams in the United States military and allied forces from around the world, features durable, heavy-duty blades designed for use in tactical, combat, and survival applications. The S.A.R. is one of Winkler's newest additions to the WKII line-up, and it fits in perfectly. Winkler's base of operations is in Boone, North Carolina, nestled in the heart of the Blue Ridge Mountains. All Winkler knives are made in America with the highest quality materials and finest craftsmanship. As a Winkler Knives authorized dealer, KnifeArt.com is pleased to offer the S.A.R. backed by our full satisfaction guarantee, hassle-free return policy, and fast, free domestic shipping on orders over $150. Add the S.A.R. to your tactical or survival arsenal today! As always superb service from these guys. Swift reliable delivery from FedEx. As for the Knive. Marvellous. Extremely solid and well built Knive. Exceptionally strong. This Knive is ideal for the application that I purchased it for - Search and Rescue. I have become a big fan of Winkler blades since a friend in the Military (SF) recommended them.